I am always interested by what Richard Branson has to say, because he is (to me, anyway) one of the most resilient entrepreneurs – don’t think for one moment that he hasn’t been through struggles, failed a few times and stood up to fight on. In my own times of reflection on business when things seem hard, almost insurmountable, I find that his words invariably inspire me to stand up and be counted by taking action. Use this passage to remind yourself that it’s all worth it. If you aren’t making a difference in other people’s lives, you shouldn’t be in business – it’s that simple. Companies have a responsibility to make a difference in the world: They owe this to their community, their staff, their customers, everyone. 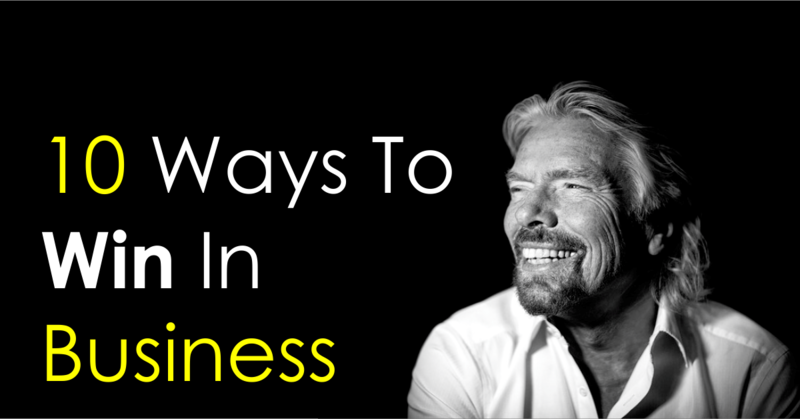 The amazing part is that doing good is also good for business –what are you waiting for? On every adventure that I have undertaken – whether it was setting up a business, flying around the world in a balloon or racing across an ocean in a powerboat – I have faced difficult moments when the easiest thing to do would have been to throw in the towel and walk away. But you’ll be amazed at what you can achieve by tenaciously sticking to your goals. When you fail, get back up, brush yourself off and try again. 5. Have fun, and make sure that your team members are enjoying themselves too. Fun is one of the most important – and underrated – components of any successful venture. If you’re not enjoying yourself, it’s probably time to call it quits and try something else. If your employees are engaged and having fun, and they genuinely care about your customers, they will enjoy their work more and do a better job. Hire people who look for the best in others, who lavish more praise than they dole out criticism, and who genuinely love what they do. 6. Delegate, spend more time with your family. The art of delegation is one of the key skills that entrepreneurs must master. Be sure to “hire to your weaknesses.” Bringing on people who can do the tasks you aren’t particularly good at can free you up to plan for your company’s future. This strategy also allows you to spend more time with your family, which is really the most important thing of all. Oh yes, and don’t forget to ask your family for input on your latest big idea – like I should have done before we launched Mates condoms, for instance! 7. Listen, take lots of notes and keep setting yourself new challenges. Keep it simple, stupid. and above all else, work and play with others. Mushrooms might grow when they are kept in the dark and fed a diet of dung, but that strategy doesn’t work with people. The Apple co-founder Steve Jobs and companies like Pixar built open work environments that invited intermingling and the sharing of visions – you need that atmosphere too. 9. Turn off your laptop and iPhone and get out there. Don’t sit in front of a screen all day. Switch everything off and venture out into the world regularly. If you’ve been neglecting this part of life, start with your own backyard, then expand your field of vision. With so many fascinating people to meet, exciting adventures to embark upon and rewarding challenges to undertake, there’s no time to lose. 10. Do what you love and keep a couch in the kitchen.